Pertaining to the rumors, OnePlus has finally released a teaser for its upcoming OnePlus 5 smartphone. OnePlus posted the teaser image on the Chinese social network Weibo confirming the name of the phone along with the release timeframe. The tagline beneath the teaser image reads “Hello 5”, which is a dead giveaway about the name of the phone as OnePlus 5. Chronologically, the name of the device should have been OnePlus 4, but the company has skipped it just like Samsung did in the case of Galaxy Note7, which should have been Galaxy Note6. However, OnePlus seems to have done it due to the bad omen of number 4 according to Chinese numerology that connects it to death. Not just the name of the device, the teaser image also reveals the release timeline for the OnePlus 5. OnePlus writes, “Hey Summer! 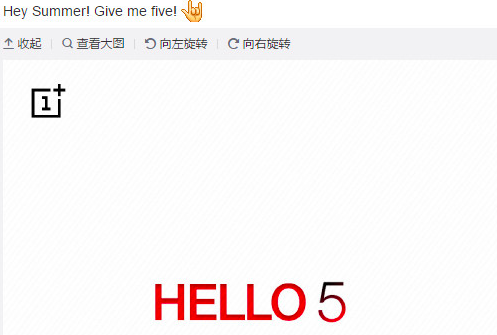 Give me five!.” It confirms that it will be released during summer maybe by the end of next month or in July. Until now, a lot has been reported about the alleged specs that are set to debut on the OnePlus 5. Many reports state that the OnePlus 5 would come with a 5.5-inch FHD or QHD display, powered by the latest Snapdragon 835 chipset. The upcoming flagship is also rumored to feature a dual-camera setup on the rear and a massive 3600mAh battery. Similar to OnePlus 3T‘s dash charge technology, the OnePlus 5 could come with a better performing charging technique that would charge the phone 25 percent faster than the 3T. According to the leak by GearBest, OnePlus 5 could also feature whopping 8GB of LPDDR4X RAM. Sadly, the 64GB UFS 2.1 internal storage seems tiny in front of the massive RAM. We wonder if the rumour proves to be true then how would 64GB storage handle the powerhouse 8GB RAM performance on the device. Well, the specs mentioned above are just “rumored” so we would like you to take it with a pinch of salt. These specs could change drastically once OnePlus makes the phone official. Until then, we can expect more information about the phone to get leaked online. We will keep you updated on everything that comes up about the OnePlus 5.